I’ll admit, I had some reservations about Hidden Folks ever since I heard about it. Even though I liked Where’s Waldo as a kid, I’m not a big fan of hidden object games. And in all appearances, that’s what the game seemed to be, albeit in a cute package. I saw screenshots and GIFs of it and thought it looked charming, but was worried there wouldn’t be much substance outside the cute drawings. But then I saw a teaser trailer that showed off some of the sound effects and I knew I had to play it. And I’m so glad I did! 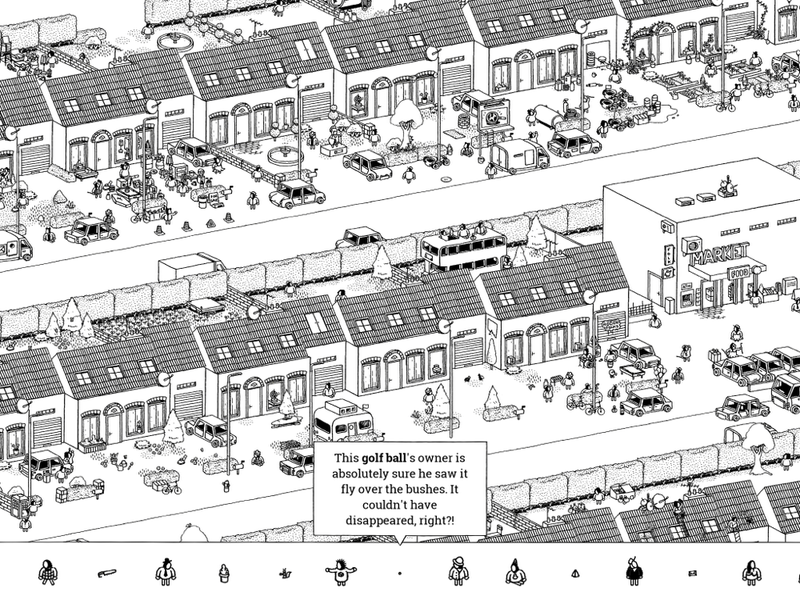 Yes, Hidden Folks is like Where’s Waldo, but it’s so much more. Each interactive scene is brimming full of life with simple, monochrome, faceless people moving about. Most stay in one spot and do jumping jacks or some other activity, but occasionally one will travel farther. There are also animals, pop culture references, video game characters, robots, and tons of interactive environmental elements. To keep things varied, the game takes you through different types of scenes such as jungle, desert, city and a laboratory. It’s perhaps something that could only exist in a world with touchscreen tablets. Yes, you can play it on a PC, but I’m not sure why you would do that instead of holding it in your lap like an interactive book. Once you have the game in your hands, you’ll just want to poke at everything to see what happens. For instance, tapping on big jungle leaves might reveal an ape hidden behind them. Tapping on an X will dig a hole, and tapping on a cloud will make it move aside a little at a time. There’s just so much in every scene, I wouldn’t blame you for just tapping wildly at everything sometimes. A bit further into the game you’ll also be able to swipe at some things, but I’ll talk more about that later. First, I want to discuss the sound effects. It’s safe to say that for me, at least, the game would not be the same without the quirky home-made sound effects. They remind me of those in Danger Dodgers, where I also spent an abnormal amount of time playing around with the different noises the characters make. 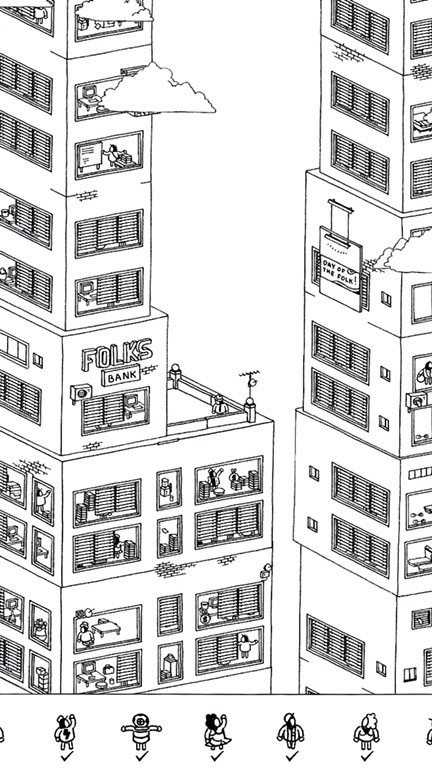 In Hidden Folks, everything is voiced by humans. There are background noises happening all the time, but most sounds are triggered by the player’s actions. Cars go “meep meep!” like Beaker the Muppet. Tap a fire to put it out and it makes a sort of breathing-through-teeth sound. Touch a cactus and you’ll hear grunts and groans. Opening a tent is accompanied by a “zip!” I can only imagine how much fun it must have been to record all these voices. Some sounds do seem to get repeated, but even late game I was discovering new ones, and the developer boasts over 960 unique mouth-originated sound effects! A few of my personal favorites are the crocodile, vulture, and computer. And there’s something else I noticed about them pretty late into my game, which I think is a really nice touch. When you pinch to zoom in, the volume increases, as though you’re actually closer to the action. Zoom out again, and the noises get noticeably more distant. It’s such a great little detail that shows how much thought went into this game. It also helps you find things you’re searching for, because if you listen carefully, you’ll hear them as you get closer. This is especially useful in large, mostly quiet scenes like the desert. The vultures are easier to pick out as you come near them because of their unique sounds. You can see and hear the game in action in the video below. But be warned, I do identify all the hidden folks and objects in this scene, so consider this your spoiler warning! Now, let me explain why I normally hate hidden object games (HOGs). They usually just give you a silhouette or the name of an item and then you have to find them among other items. They’re usually boring, without much life to them other than maybe being visually impressive. They feel like an utter waste of time to me, a chore, like looking for something I lost. I don’t find that fun. But as you can see in the video above, what Hidden Folks does differently is that each folk or item you’re meant to find has an entertaining little description that’s also a clue as to where they can be found. This turns the game into more of a puzzler and less of a test of patience, looking for a needle in a haystack. The clues are often clever, usually humorous, and occasionally downright tricky. I can’t imagine playing the game without these, at least not for long. No matter how charming the game is, I don’t think I’d have been determined enough to find everything if I was going on the drawings and animations alone. I’d say the clues and the sound effects are what made the game truly enjoyable for me. As I mentioned a little earlier, tapping is the primary way you interact with this world. Swiping moves the camera, so at first I didn’t even realize that some things can be dragged, not just tapped. Early on there are only a few items per scene that can be swiped — if any — but as you progress, you’ll see more and more, such as window blinds or garage doors. I liked this aspect, but if you don’t realize it soon enough, it could lead to some unnecessary frustration. And in scenes where there’s a lot of things to swipe open, I sometimes ended up dragging the camera instead. These are minor frustrations, though, and I do think the game is better with these mechanics in them. I should also mention that I rushed through the game fairly quickly so I could write this review, finding everything after about five hours of total play time. Because I didn’t want to waste time, I contacted the developer a couple of times when I wasn’t sure if something was a bug or feature. If I was playing at a more relaxed pace, though, I think I would have figured those things out on my own. And I do recommend taking your time with the game. It’s very user-friendly in that you don’t have to find all the items in a scene to move on the the next one. If the last few items are frustrating you, take a break from that scene and come back to it later. It feels really good when you eventually find those especially well-hidden folks, so take your time and enjoy it. Thankfully, the game has iCloud sync, so you can play the game at home on your iPad and still mess around with it on your iPhone on the go. I don’t know that I’d recommend playing only on an iPhone, though, unless you have really strong eyesight and a lot of patience. On an iPhone, the game is locked into portrait mode, which makes it a great one-handed game that can easily be played anywhere — I did it even while walking. But the screen provides such a small viewing area that you’ll spend so much time scrolling to see a little bit more of the bigger scenes. The game was clearly meant for a nice big iPad in your lap, where you can see a large chunk all at once. Even on there, one scene is so big that I’m not even sure I’ve seen every inch of it. I can’t imagine trying to play the whole game on my iPhone alone. But if you have no choice and you really want to play it on your iPhone, just have some patience with it. There are currently fourteen different scenes in the game, some small, some so vast I was discovering new things in them forty-five minutes into searching. There are a few locked scenes that aren’t available yet, but the developer hasn’t provided a release date for those. When I was close to finding the last folk in the game, it told me that I still had things to find elsewhere. Since I had already found everything in each scene, there was a brief moment where I got excited that maybe more hidden items were added to each scene. But that wasn’t the case, and it seems to just be a generic message on the last scene that assumes you have at least one other thing to find somewhere. I didn’t expect more content, but after that message I was kind of disappointed there wasn’t some secret bonus content. And at the moment, other than to play around and see what little details you can find, I don’t see much of a reason to revisit the game until new content is added. While it did provide me with a solid five hours of playtime searching for everything, I would love a reason to go back to it once in a while. Perhaps even a way for players to select a character or item from a scene, give it a description and let someone else find it. That would provide nearly endless replay value, since each scene is so full to the brim with stuff. 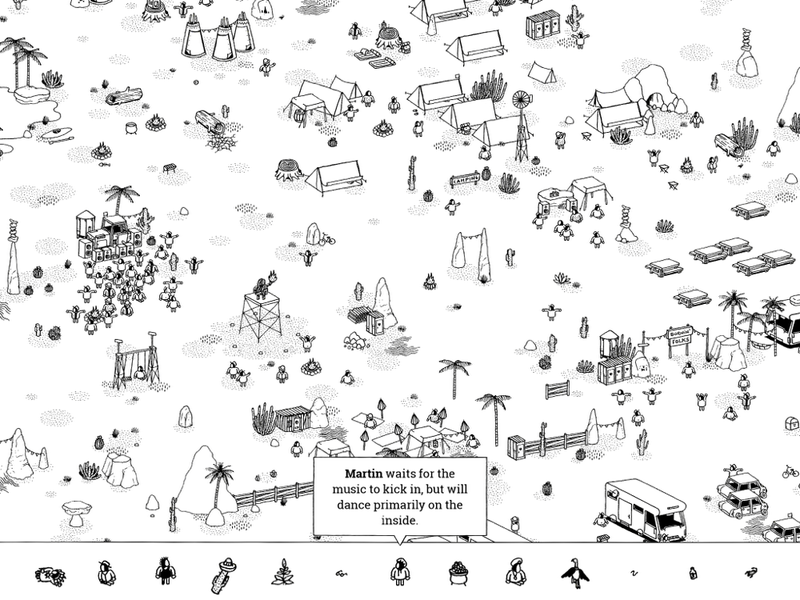 Still, there’s enough here that I can easily recommend Hidden Folks to everyone of all ages. It may look like it’s mostly for kids, but the puzzle aspect of it should make it enjoyable for just about anyone. It’s a particularly good fit for Where’s Waldo fans or those who just like poking at things to see what happens, especially when it results in silly sound effects. The character and item descriptions help raise the game from a typical hidden object game to one that feels more like a puzzler. Some of the clues made me feel like a super sleuth when I finally figured out what they were referring to. The game surprised me up to the very last moment, so it never got stale. While I don’t see much reason to continue playing right now, I can’t wait to see what the upcoming content will be like, as I’m sure these developers must have some more surprises up their sleeves. Oh and for those of you who like iMessage stickers, the game includes over a hundred of them, many animated — but sadly without sound effects. 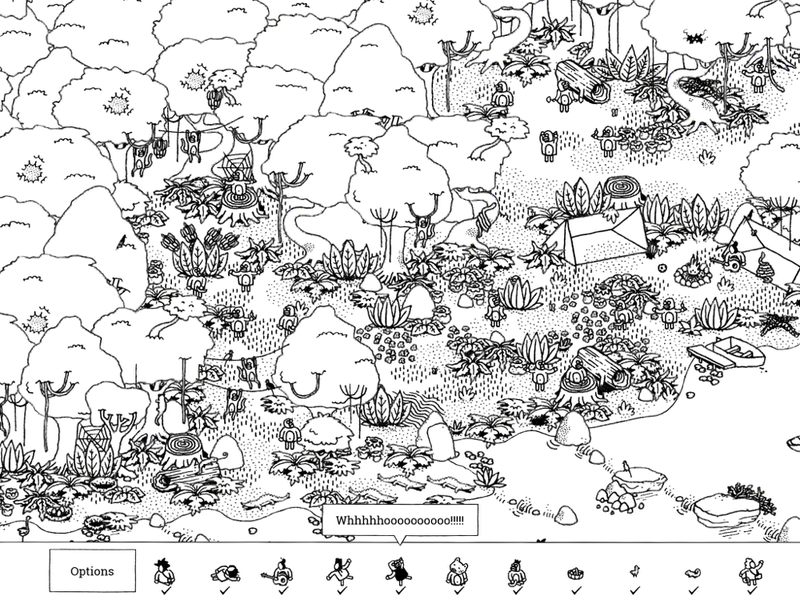 If Hidden Folks sounds like something you’d enjoy, go grab the game here and start poking!